The BBC is embracing Shakespeare’s 400th anniversary with a new project launching on Monday 21 March that focuses on the resources and stories of places all round Britain, using local BBC radio stations and the British Library. Shakespeare on Tour is a great reminder that theatre has never only taken place in the capital, and harnesses the resources of two national organisations in an inventive way. 200 stories will be broadcast by regional radio and television stations, and they have been working closely with a long-running academic project based at the University of Toronto in Canada, Records of Early English Drama (REED). 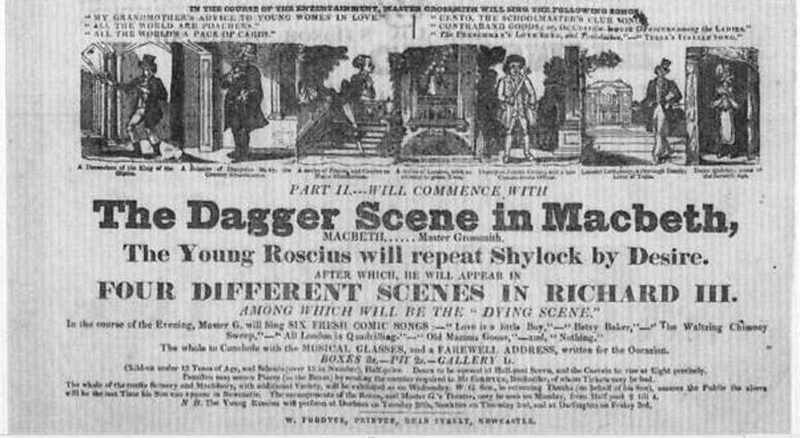 I’m particularly excited by this project because it will be using the British Library’s astonishing, and as far as I’m aware, largely untapped, collection of theatrical playbills. These ephemeral objects, a cross between a poster and a programme but flimsier than either, were created to publicise a production and to inform audiences of the evening’s events. Going back to the eighteenth and nineteenth centuries, theatres might change the plays they offered day by day. 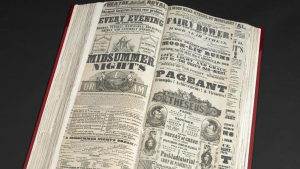 If a play was a particular success, it would be given an unbroken run, so the playbills were crucial in letting people know what was to be put on. Each theatre would issue a new playbill every day. Playbill collections can be very large, and because the bills are not always fully dated, they can be hard to identify. They’re always printed on thin, cheap paper and some can be extremely big, so they’re also difficult to store and handle. Here’s some information from the site: Shakespeare on Tour includes stories that are all linked to specific places across the country. This unique and ambitious broadcasting event will uncover surprising stories about where Shakespeare’s plays were performed, along with other iconic moments such as the first black actor to perform Shakespeare, the rise of the female star, and notable Shakespearean child actors. It also charts locations where Shakespeare’s acting companies performed – a number of which survive to this day. Craig Henderson, Head of Programmes for BBC English Regions, says: “This unique project brings together ongoing academic research as well as stories of Shakespeare performances told through original playbills from the late 18th century onwards. 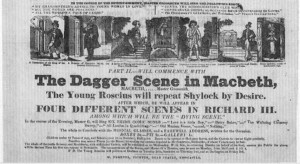 “Audiences will be able to discover factual details about their local town halls, pubs and private houses around the country where Shakespeare’s plays were performed; how much Shakespeare’s players were paid; and the project will travel forward from the late 16th centuryto track other iconic moments such as the first – and controversial – appearance of black and female performers on stage. The Shakespeare Centre Library and Archive has a collection of something in the region of 15,000 Shakespeare playbills from a variety of London and regional theatres, and a large collection from Stratford theatres from the days before the foundation of the Shakespeare Memorial Theatre in 1879. They’re indexed but not fully catalogued. As it happened, I spent some time last week looking at some of them in search of references for Stratford’s Shakespeare Club. Members of the Club bought shares in the 1827 theatre and sponsored several performances in its early days. Watch out for the broadcasts: I’ve heard that one of the first, on 21 March, will be Siobhan Keenan from De Montfort University talking to Radio Oxford about the performance of Othello by Shakespeare’s company, the King’s Men, that took place in the city in 1610. This great project will undoubtedly help to draw attention to regional collections, and to England’s rich history of theatrical productions. Also celebrating Shakespeare on the BBC last week was RSC chief Gregory Doran, who delivered the Richard Dimbleby lecture. 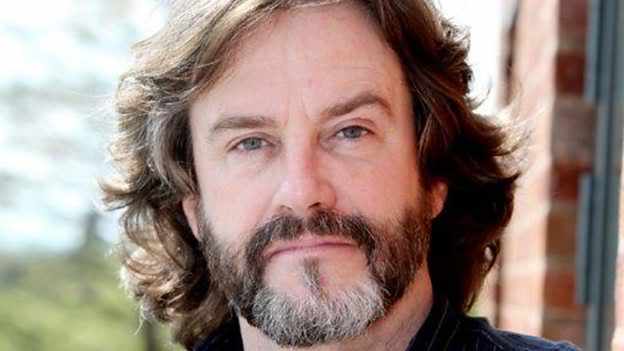 Although Doran is immensely well-informed about Shakespeare he’s always an entertaining speaker and the lecture is still available on Iplayer. This entry was posted in Legacy, Stratford-upon-Avon and tagged BBC, British Library, Gregory Doran, Infant Roscius, Master Grossmith, playbills, Records of Early English Drama, REED, Royal Shakespearian Theatre, Shakespeare Club, Shakespeare on Tour, Siobhan Keenan. Bookmark the permalink.